Girlfriends in God is a non-denominational ministry that crosses generational and racial boundaries to bring the Body of Christ together as believers. Just as God sent Ruth to Naomi and Mary to Elizabeth, God continues to use women to encourage and equip other women in their spiritual journey. We are doing life together! The Girlfriends in God Daily Devotional is our popular daily Bible devotion for women. GIG Devotionals for Women offer wisdom and insight for applying Biblical truths to the ups and downs of everyday life. Reading daily devotions provides strength and encouragement in your daily walk with Jesus Christ. My family and I got thrown into a situation recently that caused some harm and confusion. The perception and convictions of another was pressed upon us, and the consequences were anything but peaceful. Much of it was a misunderstanding about a social media post, but the reaction was layered in judgment and accusation. We agonized and prayed over how to respond in a way that would honor God. My family and I talked through flesh-led responses (revenge, defensiveness, etc.) versus Spirit-led responses (humility, love, grace, forgiveness) and, in all honesty, we also wrestled with justifiably inflamed feelings of hurt. Paul spoke of these types of in-the-church tensions in the letter he penned to the believers in Rome. He explained that the freedoms we have in Christ are to be handled responsibly, in love, and that we are to be careful to not allow our freedoms to cause a person of weaker faith (or different convictions) to stumble. Romans chapter 14 addresses this issue head on. Even when others wound us with accusations and differing expectations, God can and will tenderly teach and heal hearts that are intent to walk in His ways. In the tension of our recent family challenge, I looked for the lessons found in God’s Word. Am I determined not to put any stumbling block or obstacle in the way of another believer? Am I making EVERY EFFORT to do what leads to peace? Truth is truth and the Word is the Word. Following Christ isn’t always easy, but it is always best and always what brings Him the glory He deserves. The Bible calls believers to unity, love, and peace in Christ - even when we differ in opinions. When all is said and done, it honors God when we make every effort to love well and align our heart with the teachings of His Word. Join me today? Dear Lord, Forgive me for the times when I’m more concerned about the conviction others than I am about my own. Help me to accept other believers without quarreling or judgment, and keep me from doing or saying anything that would cause another to stumble in their faith. Read 1 Corinthians 8:9-13. How might this apply to you? 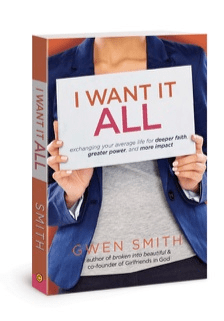 Today’s devotion is an excerpt from Gwen Smith’sbook, I Want I ALL, which includes a Bible Study Guide right in the back of the book!